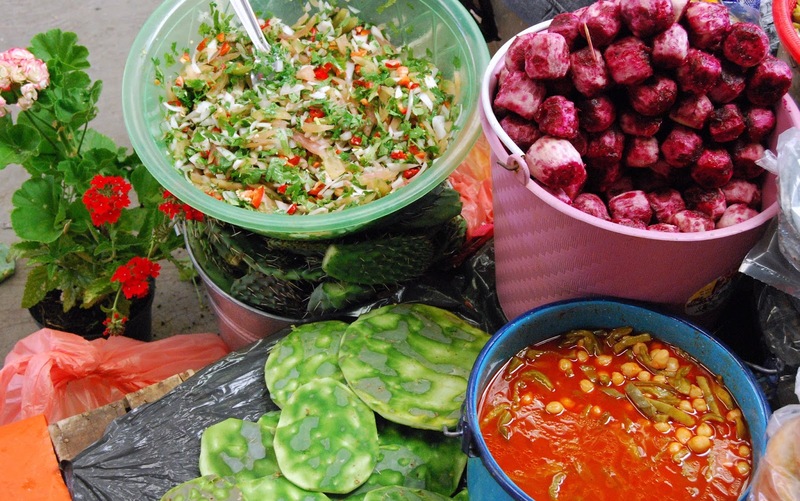 Did you know that Mexico has one of the most significant street food cultures in the world? 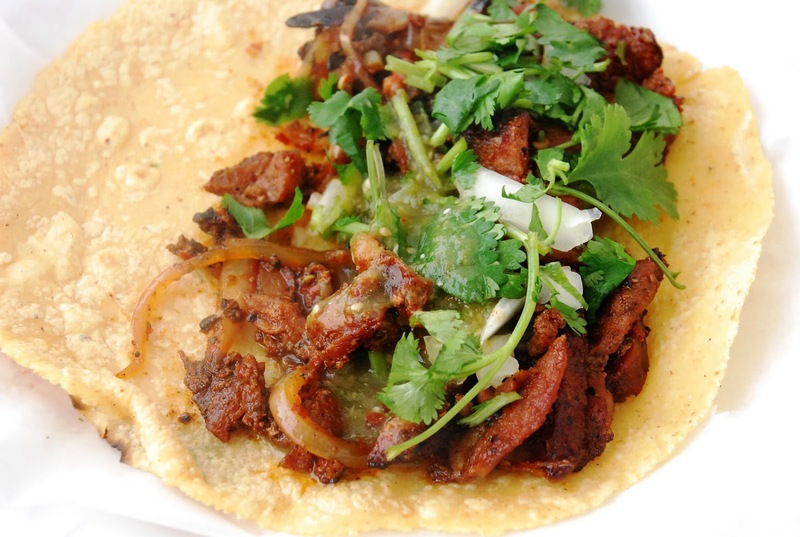 Just ask Forbes magazine who named Mexico City one of the most important cities in the world to eat street. I agree and am most anxious to take in some of the city’s significant culinary riches when I travel there next month. But you don’t need a ticket to the capital to get good quality street. Mexico offers a wide-variety of regional sensations to challenge even the most refined taste buds. Sampling my first taste of street back in Guadalajara in the late 60’s, I simply can’t get enough. 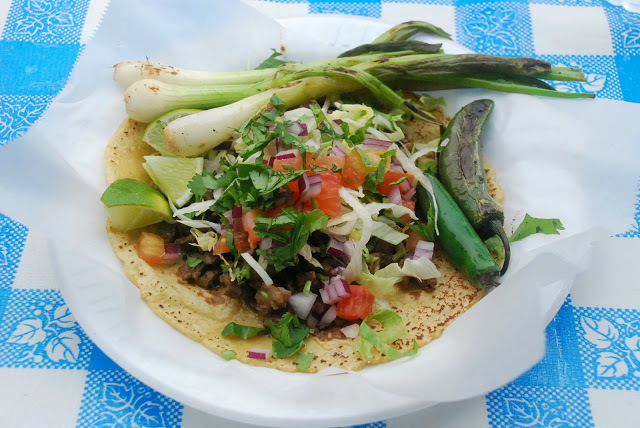 From Tacos al Pastor to Papatias, I’ve sampled some of the best…and the worst. One thing I can claim is that I have never gotten sick from Mexican Street food. It’s a fact that approximately 60% of all people in Mexico eat off the street at least once a week. One sure way to differentiate good street food is how busy the stall is. Trust the fact that locals know what’s good. That’s what I loved about Rubi’s at Maxwell Street Market in Chicago… all food is cooked to order. My hard and fast rule of thumb is that the vendors I patronize cook fresh and NEVER let food sit around. In fact, many of the Chefs that I know in Chicago come to Mexico to study street food and incorporate the delicious flavors and basics into their menus back home. Just ask Rick Bayless who is in his ninth season of taking his culinary show on the road and has brought great Mexican street to dining tables all over the world. I’ve always been a fan but was locked in last year when the season was televised from the Baja peninsula. In fact, it was Season 8 that turned me on to the great wines of the Valle de Guadalupe where I plan to go before next year. 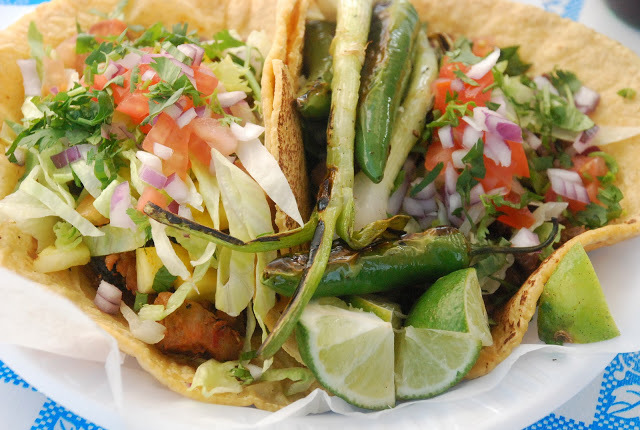 The best known taco on the planet is carne asada but my all time favorite is Tacos al Pastor. I think it’s the flavor of the pork with the pineapple. 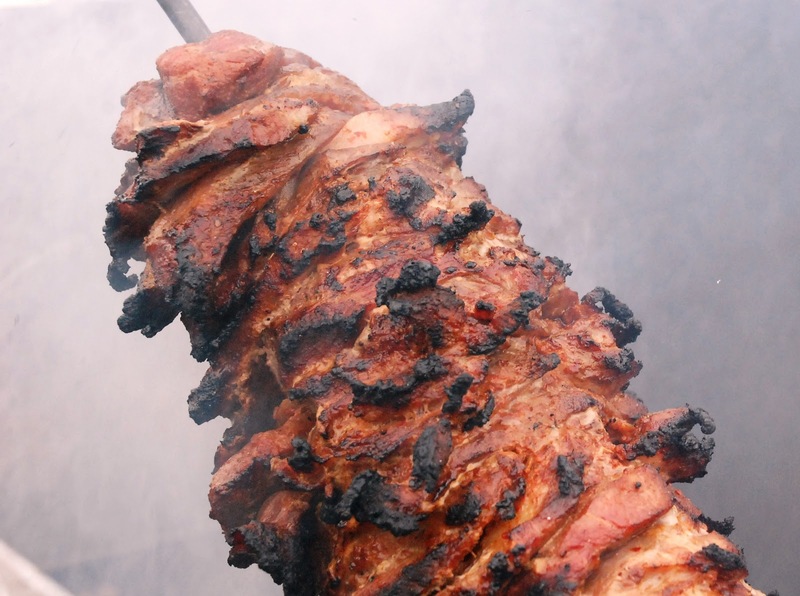 Al pastor is a dish from Central Mexico much like the shawarma spit-grilled meat brought by Lebanese immigrants to Mexico. 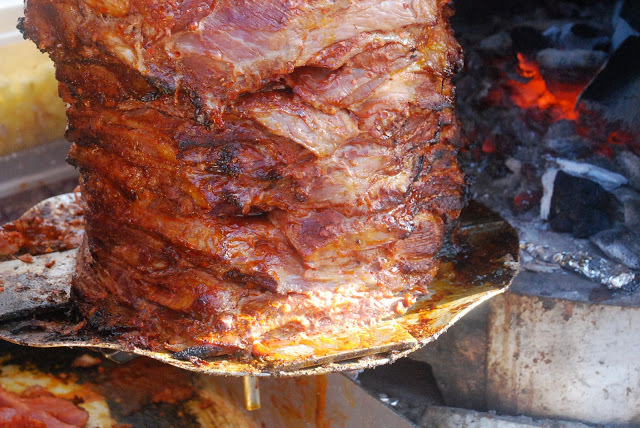 Mexico’s Al Pastor is made from pork. The pork is marinated a few days with a mix of dried chiles and cooked on a flame of a vertical rotisserie called a trompo with fresh onion and pineapple on the top. The juice from the pineapple breaks down the protein and makes the meat tender. When it’s ready, it’s sliced off the spit with a very large knife. 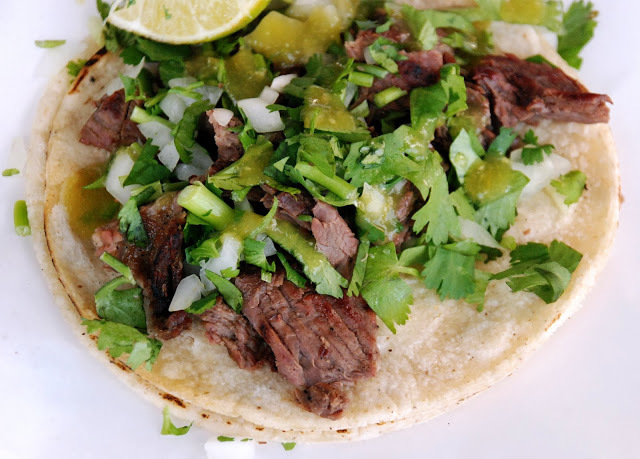 It is served on small tortillas with chopped inions, cilantro and pineapple and then topped with lime and salsa. Stem and seed all of the dried chiles and place them in a microwave-safe bowl. Cover with water and microwave at high power until softened, about 3 minutes. Let cool slightly, then drain and transfer to a blender. Add the orange juice, lime juice, coke and vinegar. In a spice grinder, grind the annatto with the oregano, cumin, clove, sugar and garlic powder until fine. Add the spice mixture to the blender and blend until smooth. Light a grill. Remove the pork and onion from the marinade and scrape most of it off. Brush the pork and onion with oil and season with salt and pepper. Grill over moderate heat, turning, until the meat is cooked through. Transfer the pork and onion to a work surface, cover loosely with foil and let stand 10 minutes. Cut the pork into strips. 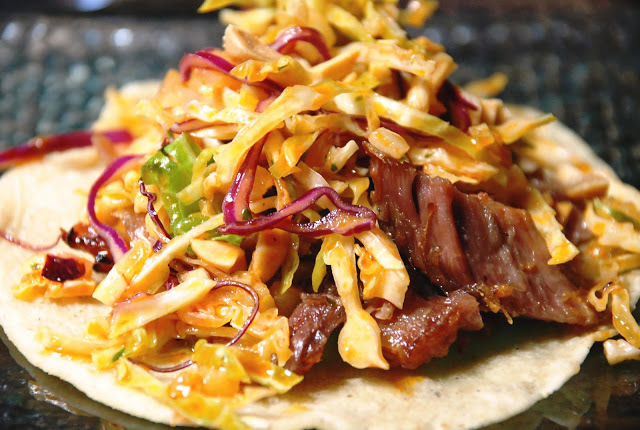 Serve the pork and onion with the warmed tortillas, grilled pineapple, red onion and cilantro. This was the first street food I ate in Mexico. A sucker for potato chips, I could not resist the papitas topped with fresh squeezed lime juice and salt. It’s still one of my all time favorite treats. Drain on paper towels, season with salt, and serve. 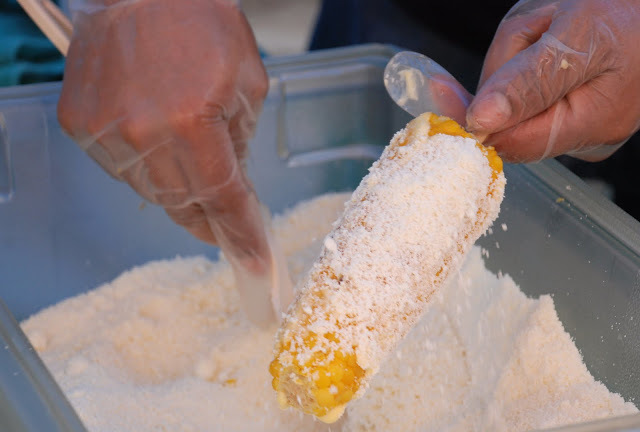 Elote is the Mexican version of corn on the cob. It is grilled and then slathered with mayonnaise and dusted with chili pepper, cilantro, salt, cotija cheese, lime juice and hot sauce. 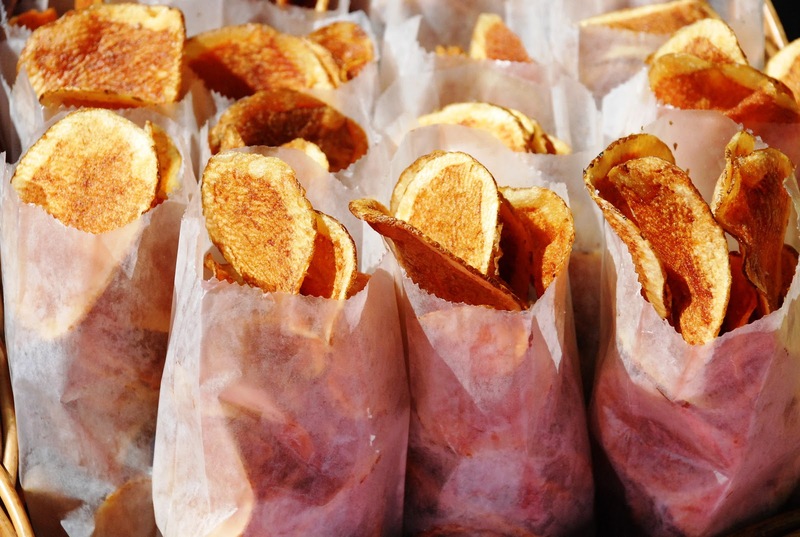 At Maxwell Street Market in Chicago, this was my go-to food first thing every Sunday morning. The cut kernels are called esquites where the same seasonings are combined with the corn and eaten with a spoon. I also like to add a little potato to step up the flavor. Build a medium-hot fire in a charcoal grill or heat a gas grill over medium-high heat. 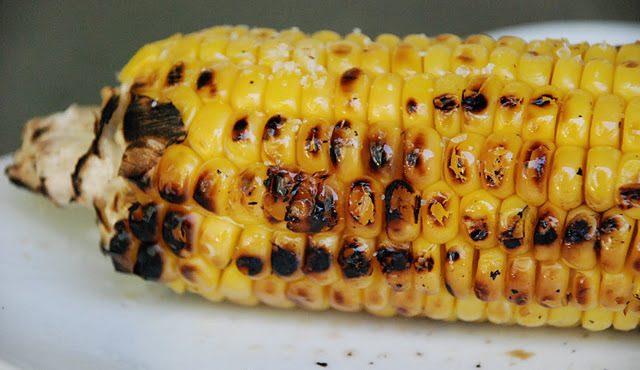 Transfer corn to grill; cook, turning occasionally, until charred and cooked through, about 20 minutes. Place cheese on a plate and roll each ear of corn in cheese to coat. Sprinkle corn evenly with some of the cilantro (optional), chile powder, and salt and pepper, pressing the corn so that seasonings and cheese will adhere to the mayonnaise. Bring a pot of water to a boil and cook corn until bright and crisp, about 4 minutes. Remove from water and allow to cool. Add potato to the boiling water and cook to fork tender, about 15 minutes. Drain and cool. Cube. Place potato cubes in a small bowl and sprinkle with garlic powder, cumin, salt and 1/8 chili powder. Coat evenly. Stir in corn. Top each with a Tablespoon if sour cream and queso fresco. Sprinkle with remaining chili powder and serve with lime. Carnitas is my favorite street food. When I was in Mexico City, Miguel, the husband of my friend Laura, use to make a Carnita run for us every Sunday morning. Miguel just told me last week that the Carnita restaurant is still there so a return trip for those Carnitas is on my list. We'll see if they taste as good as I remember. I finally learned to cook Carnitas just last month. Or should I say to cook them right. The traditional way is in a cazuela which disperses the heat evenly. Lard (yes, I lard because it’s the only real way to get the flavor) covers the dish and once tenderness is achieved, the heat is turned up and the outside of the pork begins to crisp. The carnitas can then be cooled and shredded. You can also serve with spicy slaw and peanuts. Chicharrones are made from pork skin and are cut thin and fried. These are a common snack in Mexico and sold in just about every market in large pieces. Hot sauce is usually served with them although I know people who devour them plain. Me – I have yet to acquire a taste for them. Stay tuned. I’ve learned to love Gorditas at the Saturday Organic Market. I have them for breakfast when I don’t indulge in a chocolate doughnut. 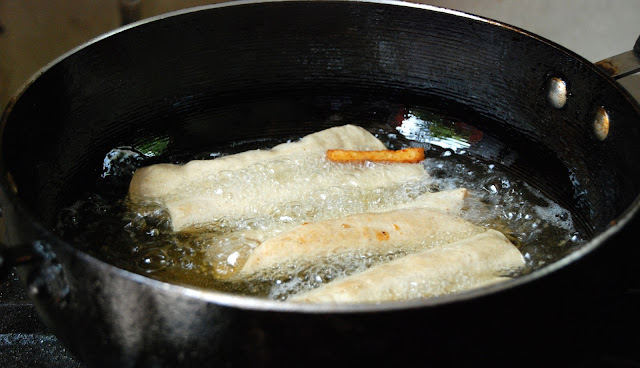 They are very thick corn dough patties fried in oil or cooked on a comal. After cooking, they are split and filled with a variety of ingredients including cheese, meat and veggies. Warning: They are so delicious, you can easily get addicted. Gordita by the way means "little fat one” and is a term of endearment in Mexico. If it weren’t for trekking the hills of San Miguel every day, I would unquestionably qualify. In my quest for the perfect torta last week, I stumbled across a little dive here in San Miguel called El Tucan. A dive that happens to make great tortas, hamburgers and everything else. 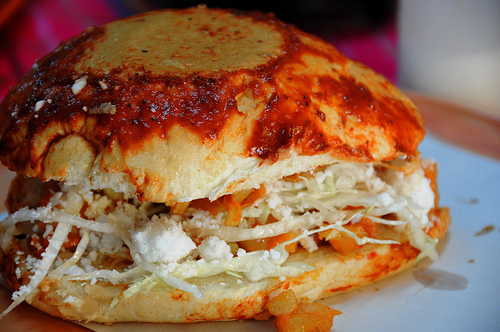 A perfect torta is a bolillo stuffed with things such as hot or cold meat, cheese, avocado, onions and pickled jalapenos. I’m pretty sure by now I am craving the pickled jalapenos because they have become one of my favorite snacks. Tortas are then overstuffed with veggies and served with a very cold beer. 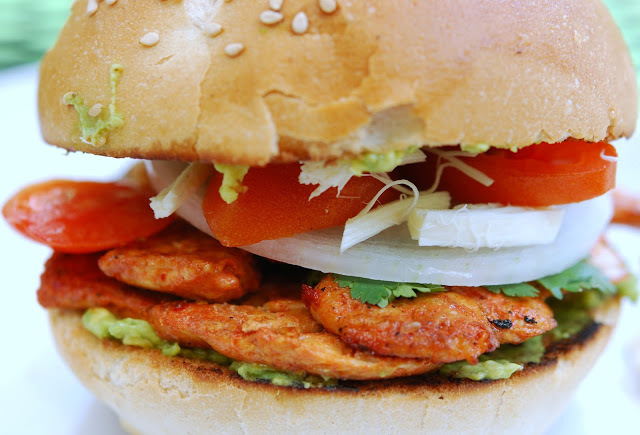 The cemita is a sandwich from Puebla and the name also refers to the roll on which it is served. It took me forever to find a cemita roll in San Miguel and even when I did I am not so sure it could be categorized as a true cemita. It was a bread roll covered with sesame seeds however it didn’t much resemble or taste like a brioche – one of my favorite all time rolls ever. I loved this recipe because the chicken is spicy when marinated in the red chili sauce. I thought that it would be hot but it had more kick than heat. Its flavor is a bit sweet so it is usually accompanied by a glass of milk or atole. Trim fat from pork or chicken and pound between 2 sheets of wax paper with flat side of a meat pounder or with a rolling pin until meat is about 1/8 inch thick. Heat 1tablespoons oil in a heavy skillet over moderately high heat until hot but not smoking. Season pork chops or chicken with salt and sauté, in batches, adding more oil as necessary, until just cooked through, 1 to 2 minutes per side. In a bowl, lightly mash avocado with a fork, then spread on both sides of rolls. Season avocado with salt, then top with cilantro. Next layer pork, cheese, chipotles, onion, and tomato. Lonely Planet travel (publisher of my favorite out of date “World Food” series guides) ranked tamales among the best street food in the world. I can’t say that tamales are my favorite food but I know a lot of people who love them. Tamales come in both a sweet and savory version. 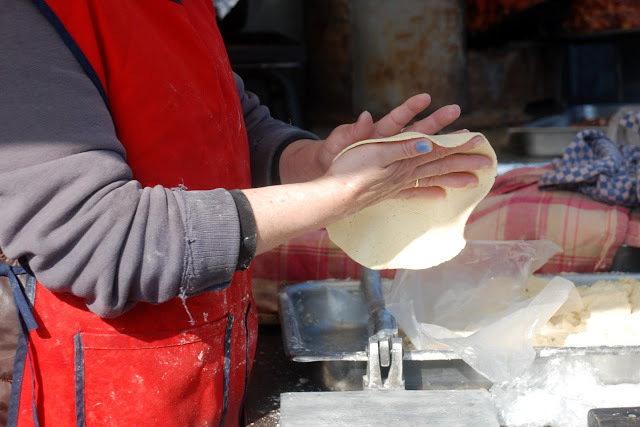 It is one of the safer street foods as it is cooked and then kept in a steam vat when being sold. There are several variations of tamales. 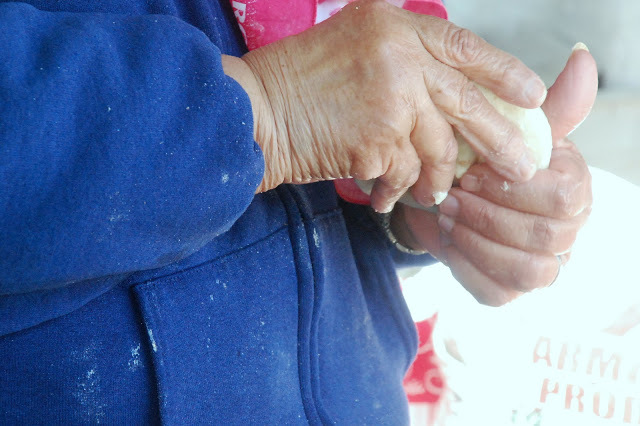 Corundas are the tamale of Michoacán and use a triangle shape wrapping. They can be eaten alone, with salsa or as an accompaniment to a meal. Here is one that I learned to wrap and another we had in Morelia at the market. The Chiapas version contains items such as raisins, almonds and regional herbs such as chipilin and wrapped in banana leaves. The wrapping is always discarded before eating. Several drinks are popular in the streets and at the markets in Mexico. 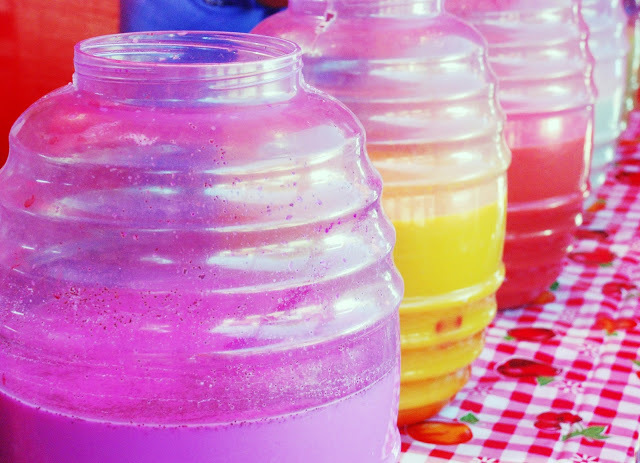 Agua Fresca is the classic street drink and have been around forever. They are made from either fruit or rice and are blended with water and sugar to make a light, refreshing non-alcoholic drink. 2. Combine half the watermelon, half the water and half the sugar in a blender; puree. Pour through a coarse strainer into a large container. Repeat with the remaining watermelon, water and sugar. Stir in lime juice. Refrigerate until well chilled, about 4 hours. 4. To serve, stir in club soda (or seltzer) and garnish with lime. 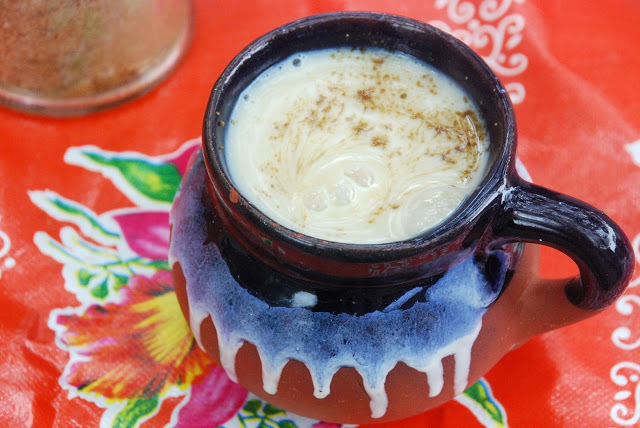 Atole is a traditional “comfort food” and is a masa based beverage. It’s typically served with tamales and is very popular during the Day of the Dead and the Christmas holiday season. It is also the other option to coffee at the Saturday organic market. It contains cinnamon, vanilla and optional chocolate or fruit. The various blends vary in texture and can range from porridge to a very thin consistency. I’ll stick with the thin as the thicker texture remind me of the cream of wheat my mother made me eat every morning when I was young. Pambazo’s are dipped in a warm red guajillo pepper sauce and used as a sandwich with fillings of papas con chorizo and a wide variety of garnishes. I know a lot of people who swear this is Mexico’s best street food. Here is Saveur’s version of Mexico City’s favorite sandwich. Heat a 12" skillet over medium-high heat. Working in batches, add chiles, and cook, turning once, until toasted, about 2 minutes. Transfer all chiles to a large bowl; pour over 4 cups boiling water, and let sit until chiles are soft, about 30 minutes. Drain, reserving 1 ¼ cups soaking liquid, and remove stems and seeds from chiles. Transfer chiles and reserved soaking liquid to a blender along with garlic and onion; purée until very smooth, at least 2 minutes. Pour sauce into a bowl; set aside. Bring a 4-qt. saucepan of salted water to a boil over high heat; add potatoes, and cook until just tender, about 10 minutes. Drain and set aside. Heat 2 tbsp. oil in a 12" skillet over medium heat; add chorizo, and cook, stirring to break up into small pieces, until browned and cooked through, about 8 minutes. Add potatoes, and cook until potatoes are very tender, about 2 minutes; season with salt and pepper and set aside. Using your fingers, scoop out and discard the insides of rolls, leaving a ½"-thick shell. Place about 1 cup potato-chorizo mixture on roll bottoms, and cover with tops; press sandwiches lightly to flatten and compact filling. Heat 2 tbsp. oil in a 12" skillet over medium-high heat. Submerge two sandwiches in chile sauce until thoroughly soaked, at least 10 seconds; place in skillet, and cook, pressing constantly with a metal spatula to flatten and flipping once, until browned on both sides, about 5 minutes. Transfer to a cutting board; repeat with remaining oil, sandwiches, and sauce. Open sandwiches and divide lettuce, cheese, and crema among sandwiches; close sandwiches again and serve warm. The size of the corn masa plays a huge role in the toppings added and what a dish is called. Honestly, I didn’t even know what Tlacoyos were until I came to San Miguel. I’ve probably eaten them at some time or another but I never paid attention. It was breakfast and back then I just didn’t care that much about food. 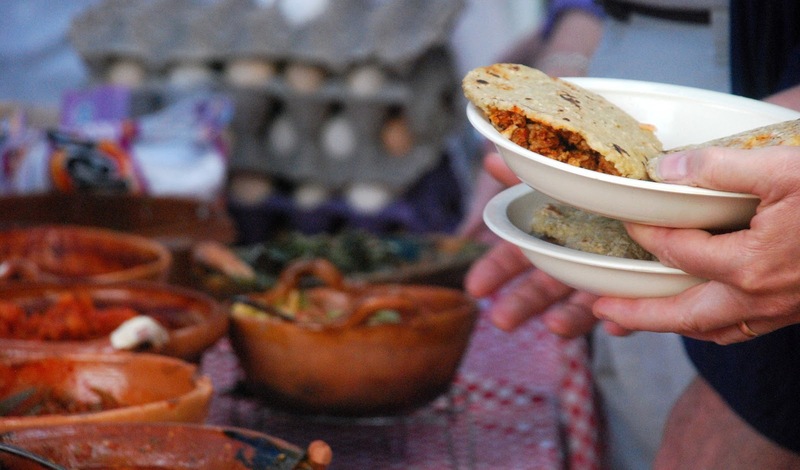 Traditional Tlacoyos are filled with refried beans—the most traditional—or with requesón (ricotta) flavored with Mexico’s finest herb: epazote. I order it with everything and get a pile of non-traditional toppings like crema, salsa and cotija cheese. No need to soak the beans for this recipe. In a large pot over medium heat, heat the oil until it shimmers. Add the onions and cook, stirring frequently to prevent burning for ten minutes or so until the onions have a golden color. Add the beans and two quarts water to the pot. Add the epazote. Bring to a boil, reduce to a simmer, and let cook for two hours, stirring occasionally. If the water level gets less than a half-inch over the beans, add more water to cover. When beans are tender, without chalky texture at all, add salt to taste. Stir well and simmer for fifteen minutes more so beans absorb salt. Drain the beans, reserving the liquid, and mash them up with a fork. If you find the beans are too dry to mash, add some of the reserved liquid back until you have a spreadable paste. Mix the masa, shortening, salt, and water together until the dough resembles a soft chocolate chip cookie dough. Divide the dough into 12 equal parts, form into balls, place the balls on a plate and cover with plastic wrap. Heat a griddle or dry skillet on medium heat. Get the tortilla press out. Cover the bottom plate with a square of heavy plastic. 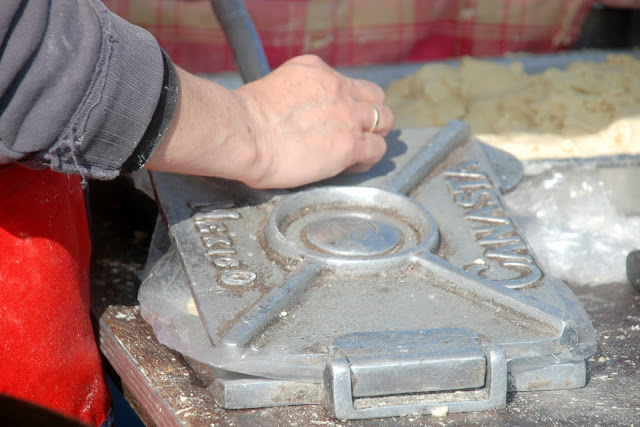 Take a ball of dough and place it in the middle of the press. Put eh second sheet of plastic on top of it and close the press. Push down lightly on the handle to evenly press the masa. Remove the top sheet of plastic. You will now have a flat round tortilla-like object. Leaving a half-inch gap at each end, drop a teaspoon's worth of mashed black beans in a vertical stripe from top to bottom of the masa circle. Reach under the plastic and fold two sides in towards each other, parallel to the stripe, loosely covering the filling. You should now have a long box with round ends with the black bean stripe running down the center, partially covered by the folded in sides of the circle. Working from underneath, fold and pinch the masa at the open ends to close it over the bean filling. The goal is to form an oval, but mine ended up more like rectangles. It won't affect the flavor as long as you keep the black beans on the inside and the masa on the outside. Place the finished masa oval in the dry pan and toast it for ten minutes. Repeat the forming procedure and add the rest of the tlacoyos to the pan as you can. Toast for about 5 minutes per side, removing finished pieces or batches before adding new ones. The tlacoyos will firm up and the masa will feel more brittle. Set aside on a cooling rack until all are finished toasting. You should have some dark marks on each one from the pan. Remove from the cooling rack and place on a plate them cover in plastic wrap again. Put a baking sheet in the oven and set the temperature of the oven to the lowest possible setting (Probably 150-200 F).Add 1/3 cup of oil to a skillet and heat until shimmering. Working in batches, carefully lay tlacoyos in the pan until the pan is full but not crowded. Fry for two minutes then turn the tlacoyos over and fry the other side for two minutes. Drain on paper towels, then put the finished tlacoyos on the baking sheet to hold until you are finished with all the pieces and are ready to serve. 1/3 pound hot cooked chorizo. 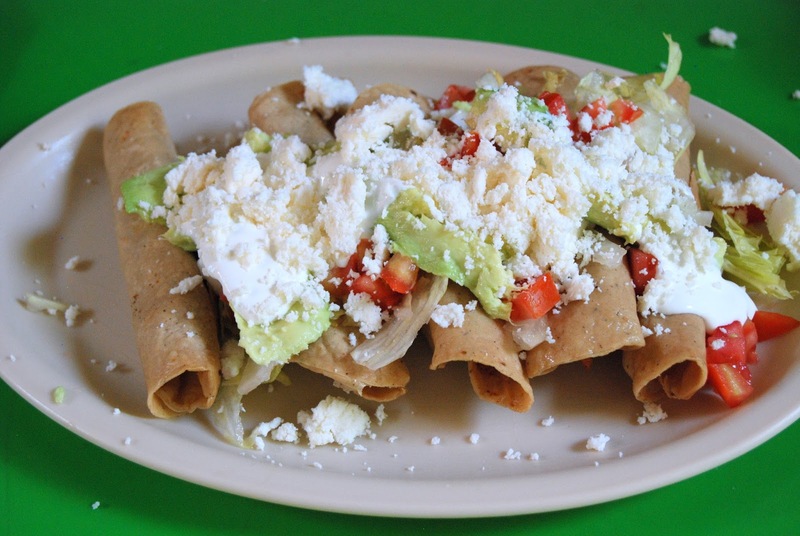 Flautas are now one of my favorite eats in Mexico. These are tortillas filled with chicken or pork and deep fried. The crunchy snacks can be served plain or topped with lettuce, sour cream and crumbled cheese. I get my flauta fix at El Tucan. An order comes with five flautas but if I’m not that hungry Alex lets me order just one. Five are just 25 pesos or $1.96. Preheat the oven 325°F. Fill a pot with peanut or canola oil on medium-high until it reaches 375°F. Melt butter in a skillet over medium heat. In a large bowl, combine chicken, paprika, kosher salt, garlic powder, cumin, chipotle, chili powder, cayenne, and black pepper. Add chicken and cook until warmed through. 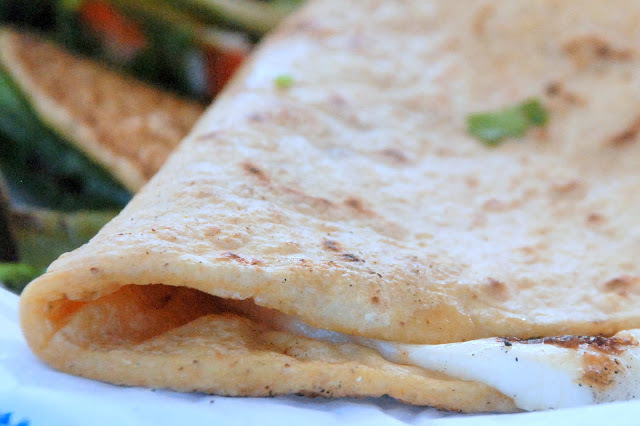 Place chicken mixture in the middle of tortillas and sprinkle with queso fresco. Roll tortilla and secure with a toothpick. Add tortillas to the oil, holding closed for a moment to set the shell. Cook until crisp and light golden in color, about 2 minutes. Place flauta on a paper-towel lined pan. Cook the tortillas in batches. For the sour cream, mix with lime juice. 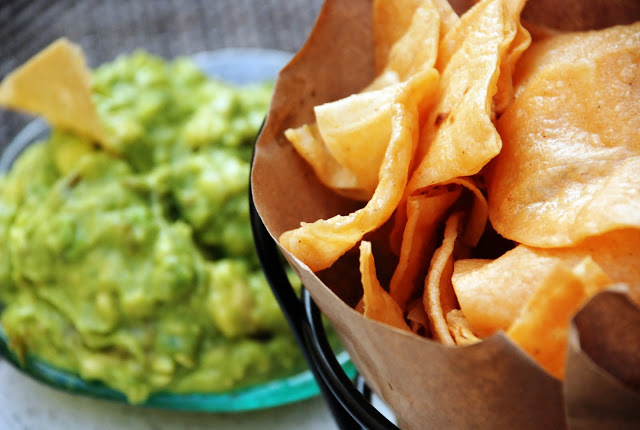 Serve the flautas with the lime sour cream, salsa verde, and a dollop of guacamole. I found this gazpacho, my favorite cold soup in Playa del Carmen. It’s cucumber, jicama, pineapple, mango, and other fruits and veggies mixed up with tomato juice, hot sauce, lime juice, chile powder, and cheese. I skip the cheese. I diced everything really chunky which is exactly how I like my Gazpacho. I also add avocado. This dish is a super refreshing option on a hot day. Gazpacho is frequently served by beach vendors in many of the resorts in Mexico. The little Mexican grocery in Highwood near where I live in Chicago serves sliced jicama as a snack every day. I’ve grown to love the crunchy texture and especially like it in a mixed salad with loads of fruit. Slightly sweet, it’s hydrating and high in fiber, with plenty of antioxidants, and vitamins. Happy Street Eating and Buen Apetito!